Battle of the Bands - Official Entries - John15 Rocks! John15.Rocks organized its first Battle of the Band. Iba’t-ibang banda mula sa iba’t-ibang schools and churches ang sumali sa event . 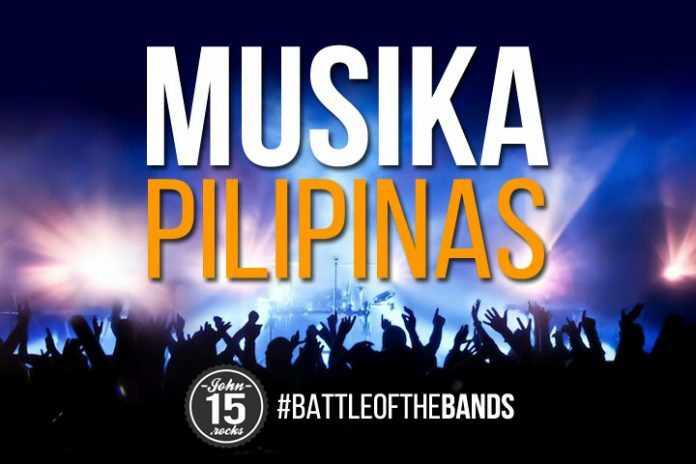 Ang purposes ng BOTB ay upang maipakita ang talento ng Pinoy at ibahagi ang ebanghelyo sa pamamagitan ng musika. The first to audition was ThyStories at ang humabol for the last spot was Unashamed. Originally, pito lamang ang dapat pumasok, pero magaling ang talentong Pinoy. Ito ang mga nanalo mula 15 entries. Their entry was the most striking composition we heard. A genuine talent, these guys should have their own label. Began in 2013, the group is composed by talented siblings and friends who is serious about their music. Their original composition is unique and bears all that is Filipino. Mabuhay Eight band! Four barkadas whose composition is unique and passionate. They are serious in coming out with an authentic brand of music. With that passion also comes their desire to worship God through music. Their own composition “Maria” is one of our favorites. It’s an intentional off-scale genre. Their band began in 2017 crossing band members with the Manifest. Keishia, their singer whose voice captivates because of her heartfelt devotion in singing for God’s glory. Formed just a few months before the competition, they’ve been friends for seven years, knitted as the Praise and Worship team of their church. They were the wild card but the spotlight turned on them that night. Surely, this band has a clear mandate from heaven. Likewise a homegrown talent from their Christian church, this band is a serious contender. With the passion and dedication of their vocalist, Alvin has set his goal. They were a crowd favorite with cheers that reach the sky. Formed in 2016 as a church band, their friendship was redefined in order to spread God’s love through music. They are Methodists that uniquely sings Christian rock. Their instrumentation and teamwork was impeccable. The third band from CSOL. These guys are a pure talent. Mostly Christians from CCF, the golden voice of Rhombus brought the house down and the steady and solid drum techniques of Jeric was enough to make this band a true winner. The first CSOL band to join, these young graders may appear shy and timid, but their hearts are bursting with talent and God’s radiance. They enjoyed each moment from the time of their audition. On the event, they had two strikingly beautiful and serious talents who made sure, God alone was lifted high. The future of Pinoy Christian Rock are these extremely talented young boys. The band is composed of early graders being trained to use their talent for God. They came out as winners, a crowd favorite and pleaser, they did shine for God! These very reserved talents showed that night that heart and passion in singing are what they do best. With their talented drummer and the rest of their equally talented guys, two kilometers of success is not enough. They are a serious bunch who owned the stage that night. Their original composition and singer Jacob was a crowd favorite. Like a matinee idol, he brought the house down and showed everyone how music should be rendered. They had a special connection with the audience that lasted even after the event. They started jamming with friends for fun. Their main purpose is to show everyone that who listens to their songs will hear “the manifestation of God.” With their multi-talented drummer, guitarist, leader – Reyver proved that the night belonged to them. As fresh and young as they look, the band was formed for the competition. The perfect tandem of Raf Aserit and Shannon Sitay was John15.Rocks personal favorite. This band reflects the quintessential Pinoy talent. They scored very high on social media singing their own composition. Mostly Grade 12 students from Cavite School of Life (CSOL), they also come from different churches with one purpose and goal, that is to sing for praises for the Lord. This group was another crowd favorite and they sang twice that night, giving glory to God.